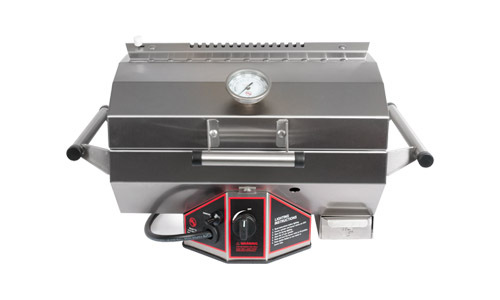 Our Wilmington Grill Traveler is a portable grill that is designed for single person to move. Unlike other portable grills, the durable design of the Traveler will handle the stress traveling puts on a grill. It is made from the same construction style as our larger grills, just in a smaller size you can take with you wherever you may go. The Traveler features our exclusive seven-sided top design made from heavy duty 304 stainless steel. The grill uses our exclusive stainless steel tube burner rated at 10,000 BTUs, which sits under a stainless steel flame tray. The unit also comes with a slide out grease tray to make cleanup easy. During use, the Traveler can sit on a picnic table or can be mounted on a deck or patio with our Traveler Post Stand accessory. We also offer additional mounting accessories for the Traveler. With the optional mounts, the Traveler easily attaches to our Reese trailer hitch adapter or our boat adapter and and grill out anywhere! Cooking Area: 14.7" x 18.5" over 272 sq"